The cross form of settlement is often directly derived from natural circumstances, like crossing roads. The original Latin expression of a quadrivium points to this particular situation. The cross is a four-division tool seeking to divide a given ‘space’ from a unity (a central point) into four (equal) quarters. The movement of creation is from the inside to the outside and the space is not enclosed (unlimited). Fig. 539 – The basic layout of a Roman settlement, either military or civilian, consisted of two crossing main streets, the kardo (N-S) and the decumanus (E-W), and four blocks, called the centuria. The Roman surveyors used a given set of geometric tools based on a cross, called the groma (or stella). This surveying instrument was depicted on a tombstone of Lucius Aebutius Faustus in the first century BC and was also found in a surveyor’s workshop in Pompeii during excavations in 1972. It is now in the Archaeological Museum of Naples (in a locked technical hall; DILKE, 1971/1992). The groma was used to determine right angles. The kardo maximus and the decumanus maximus were the most prominent to establish a new settlement (fig. 539). The former (KM) runs north – south, while the latter (DM) follows the east – west direction. These axes formed the structure for a centuriation (centuria) consisting – in an ideal case – of four times ten or twenty-five squares (‘Ab uno umbilico in quattuor partes omnis centuriarum ordo componitur’) (MÜLLER, 1961). Deviations of this pattern are known and the direction of the layout (of the centuria) is sometimes changed in time, as was studied by CLAVEL-LÉVÊQUE and FAVORY (1992) in the areas of Nola (Naples) in Italy and Béziers in France. Three different types of networks were established in the latter area called the ager Baeterrensis. It is known that a scamnatio in centuriis (internal division and organization of a parcel of land) existed in the Béziers area at the end of the second and the first part of the first century BC. when the area must have been well populated. The direction of the roads followed the natural topographical features like rivers and streams, which is NW-SE and NE-SW (fig. 540). The Roman occupation in Gallia Narbonensis started with the campaigns of Julius Caesar from 58 BC onwards. Roman veterans of the VIIth Legion founded Béziers in 36-35 BC and their colonial presence had a marked influence on the countryside. Fig. 540 – The structure of the colonial centuriations in the area of Béziers (France. The orientations of the lands (limites) is shown here as NW-SE and NE-SW, following the main features of the terrain and the road established by Domitian (via Domitia), who ruled the Roman Empire between 81 and 96 AD. This initial pattern was superseded by a cadastral system, known as Béziers A, with a strict NS-EW pattern (fig. 541). This centuriation was dated (by Clavel & Favory) between the emperors Vespasian (69 – 79) and Hadrian (117 – 138). This fifty-year period overlaps the situation during the reign of Domitian and shows the difficulties of establishing a historical sequence in the various cadastral stages. One may wonder why the directions of centuriation changed within the given period. Also the difference between the direction in fig. 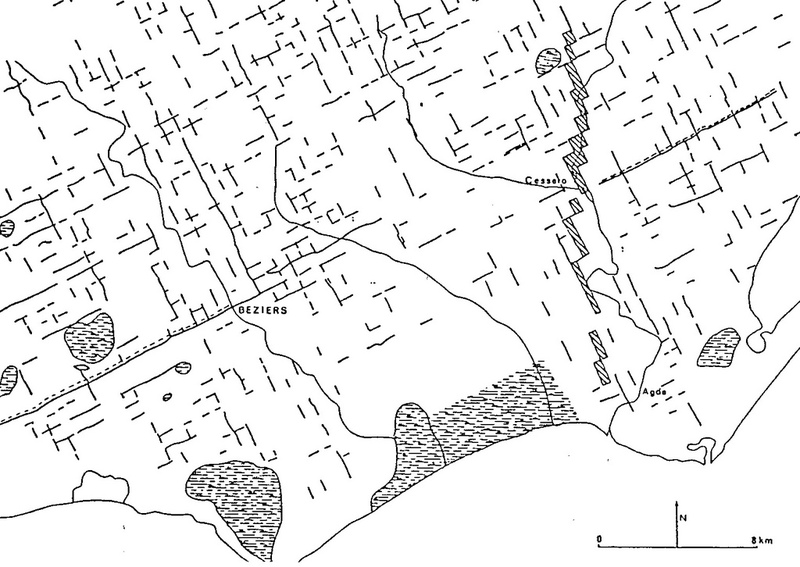 540 – around 25º NE – and the results of a later geo-archaeological-computing approach by Clavel-Lévêque et al resulting in a prevailing Roman cadastral system in the area of Beziers oriented at 33º needs further explanation. Fig. 541 – This centuriation of the Béziers area of southern France, known as Béziers A, shows a stage of cadastral preference with a NS – EW orientation. It followed an earlier system based on more topographical elements. Manuscripts like the Codex Arcerianus A at the Herzog-August Bibliothek in Wolfenbüttel (Germany) – also known as the Corpus agrimensorum Romanorum – which dates from the sixth century AD, give illustrations of the various methods Roman city planning. The Palatinus Vaticanus Latinus 1564 (Biblioteca Apostolica Vaticana) is also fully illustrated. 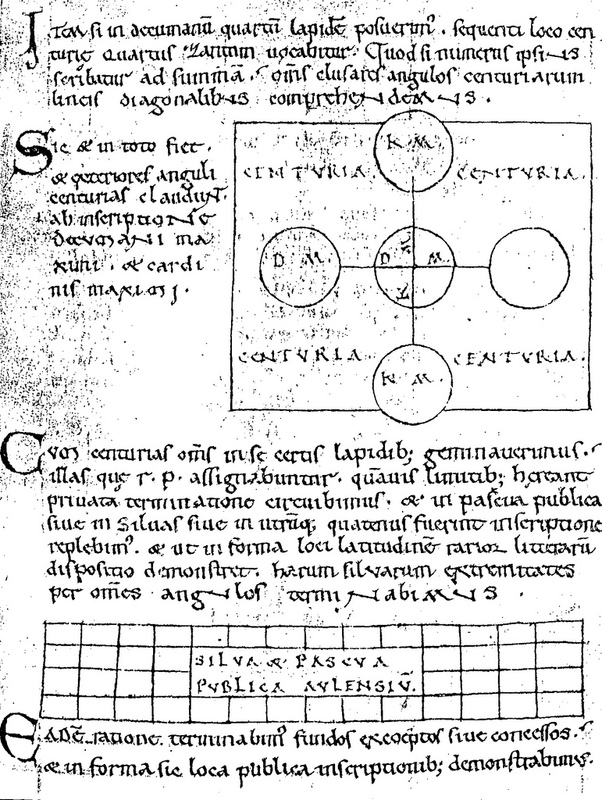 Only the geometrical drawings are given in the Laurentianus Plut XIX cod. 32 manuscript in the Biblioteca Laurenziana in Florence. The Corpus agrimensorum is a collection of manuals of various dates (DILKE, 1971/1987) and provides the essential information on classical cadastral measurements. The old documents of the first to the seventh century were copied in the later Middle Ages and formed the link to a more modern understanding of the Roman agrimensores of ‘land measurers’. A page in a twelfth century manuscript gives a summary of these old books (HARVEY, 1991) (fig. 542). Later books, like Giovanni Pomodoro’s ‘La Geometria prattica’ (Roma, 1667) indicate that the art of land measuring was still an Italian specialty, which was associated with their ancient love of geometry. Fig. 542 – This page from a twelfth century manuscript on Roman surveying reflects the basic elements of city design with the KM (kardo maximus) and the DM (decumanus maximus) surrounded by four centuria. The geometric forms of the Roman design caught on in the Italian Renaissance. 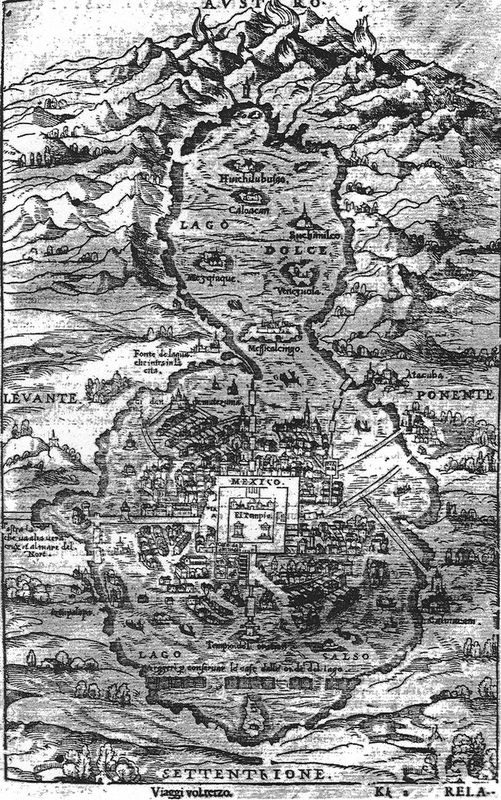 Marco Fabio Calvo’s publication of the old city of Rome in 1527 gave several interpretations of the outlay of Rome in various periods (MARCONI, 1973). Much of it, including a Roma quadrata, seems to be rather fanciful, and more inspired by a dedication to a geometry-in-general than representing a historical situation (fig. 543). Fig. 543 – Roma quadrata (quadripartite Rome) was the name for the oldest habitation of the Palatine Hill during the time of Romulus (eighth century BC). 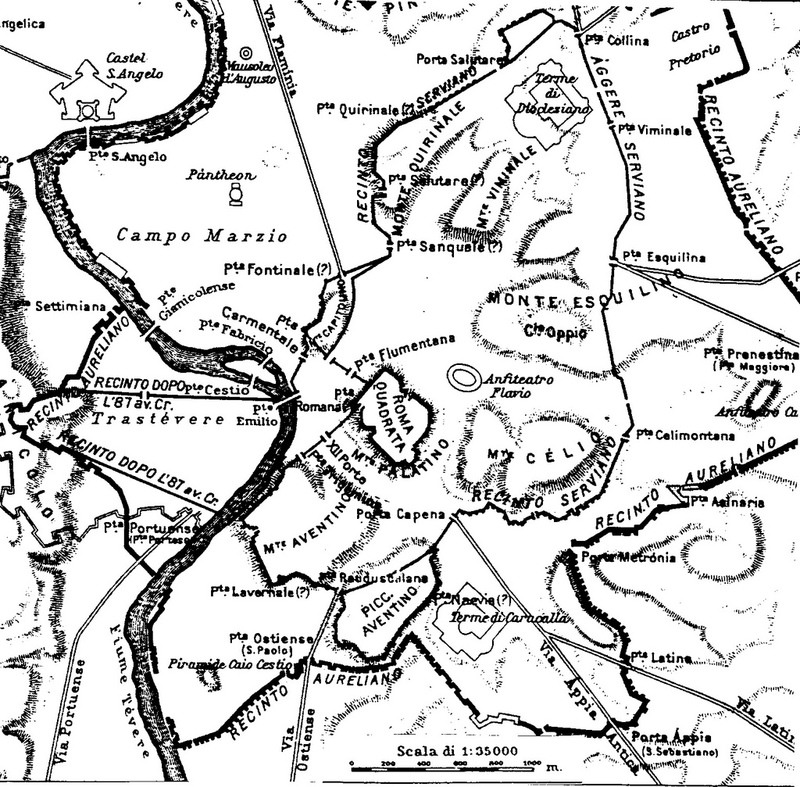 The initial settlement also comprised communities on the other hills of Rome: Quirinalis, Viminalis and Esquilinus. King Servius Tullius divided the city in four sections: Suburran, Esquiline, Colline and Palatine. Later he joined the Palatinus and Quirinalis by a wall and established the core of the classical city of Rome. The cross – as a Christian symbol – started its course of victory in the legend of the Milvian Bridge in Rome, when Constantine promised to Christianize Rome when he would win the battle with Maxentius (312). The cult of the cross caught on from about 500 AD onwards, when its function as a torture instrument had faded. Pope Sixtus V, the devoted builder of Rome in the early sixteenth century (see fig. 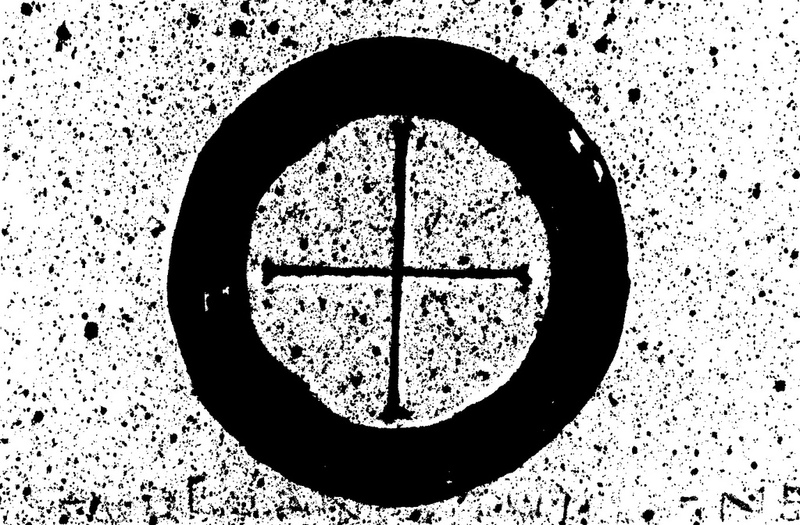 470), was a propagator of the cross and used the sign as a legitimization of the strength of the Church. SCHIFFMANN (1985) mentioned an unpublished document in the Biblioteca Vaticana (Ottob. Lat. 568) in which Foglietta pointed to the cross-shape in the street pattern of Rome. However, it is doubtful if a ‘sixtinische kreuzinterpretation’ has played a serious role in the development of the city. The division in the city of Rome along the lines of a kardo and decumanus seems rather artificial, since the historic city of Rome did grow in a natural way on the various (seven) hills. Nevertheless, it is possible to see the Via Papalis as the kardo, with the basilica in Lateran and the Vatican at the end. The decumanus runs from the churches of S. Paolo fuori le mura (St. Paul’s Outside the Walls) to S. Pudenzina. The Colosseum is situated at the cross point. 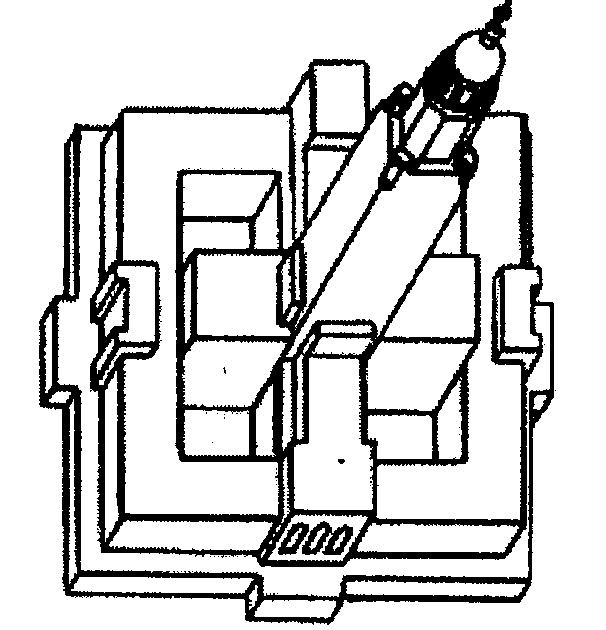 Das ‘Patriarchalkirchenkreuz’, as proposed by Guidoni (1972), might be more the outcome of wishful thinking since the initial intentions of the builders are hard to prove. It is also questionable if the medieval cross shape of many cities finds its origin in the antique Roman history of kardo and decamanus or was a reinvention of the tetradic principle in a Christian era. 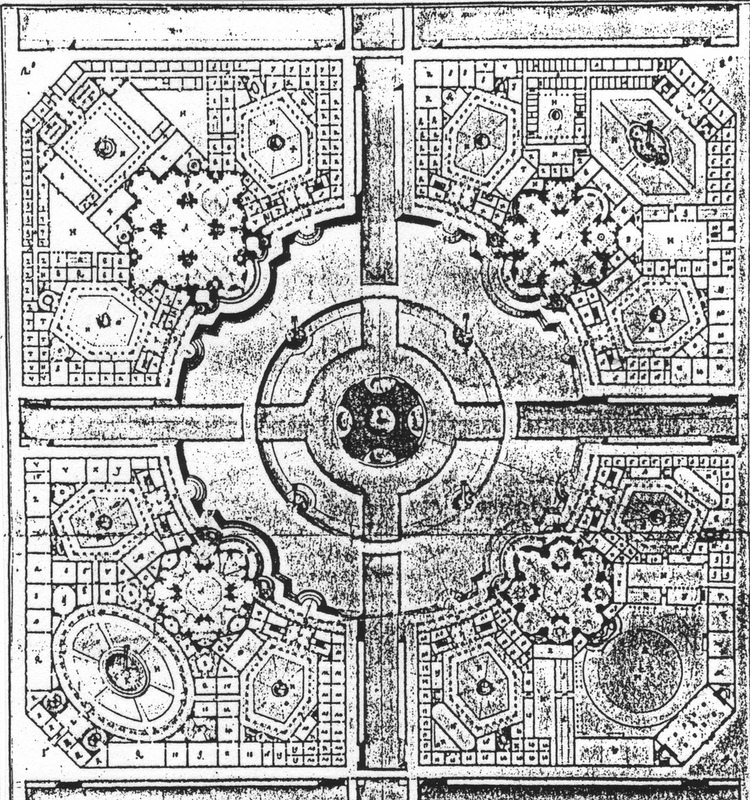 SCHIFFMANN (1985; p. 137) pointed out that ‘It was only in the cross shaped street plan of Palermo around 1600 – with the fountain in the Quattro Canti (Four Corners; fig. 544) – that the Christian meaning of the cross as signum became in the public domain. It seems that the clerical powers of that period took the opportunity to celebrate the cross as a Christian symbol in any city with a quadrivium (cross roads), regardless of its pedigree. Fig. 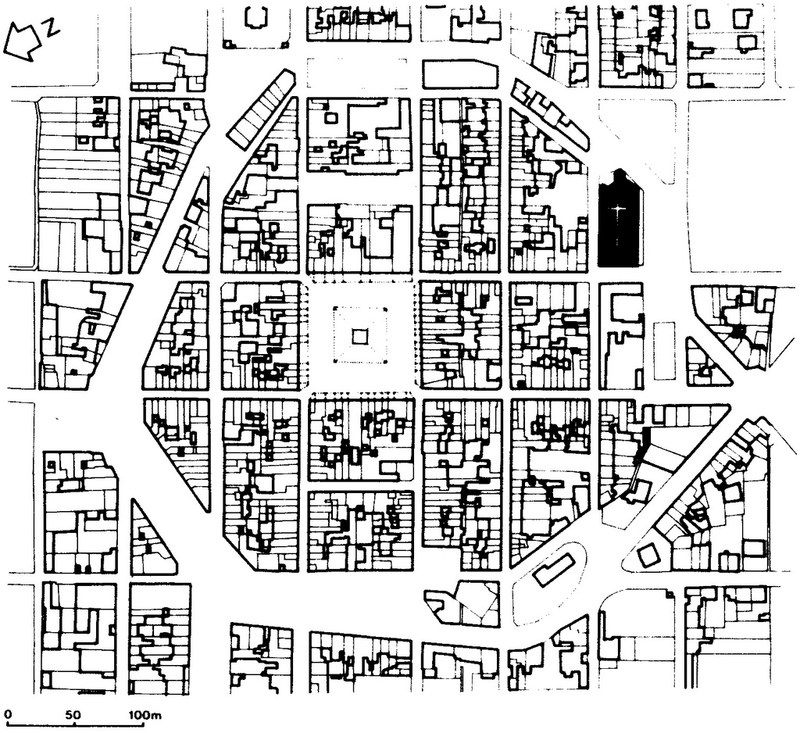 544 – The ‘Quattro Canti’ or Four Corners (Piazza Vigilena) on the centre point of a cruciform town plan in Palermo (Sicily). The dedication to the sign of the Cross was celebrated in 1609 with two great processions in the streets. Part of the ‘Quattro Canti’ (Four Corners) in Palermo – Photo: Marten Kuilman (2012). 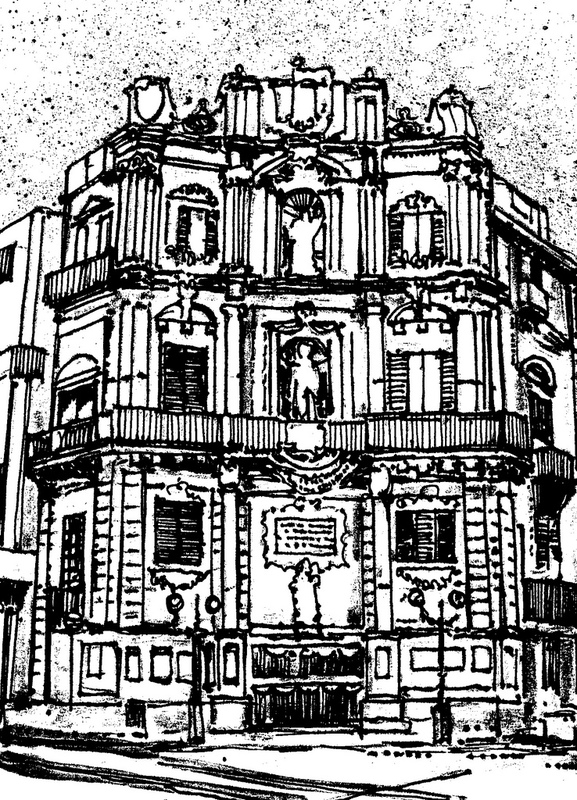 The Quattro Canti is situated at the intersection of Corso Vittorio Emanuelle and Via Maqueda, which is the traditional center of Palermo. Officially, the square is called the Piazza Vigilena, after the Spanish Viceroy, who had the plan of the ‘Four Corners’ executed in 1611. 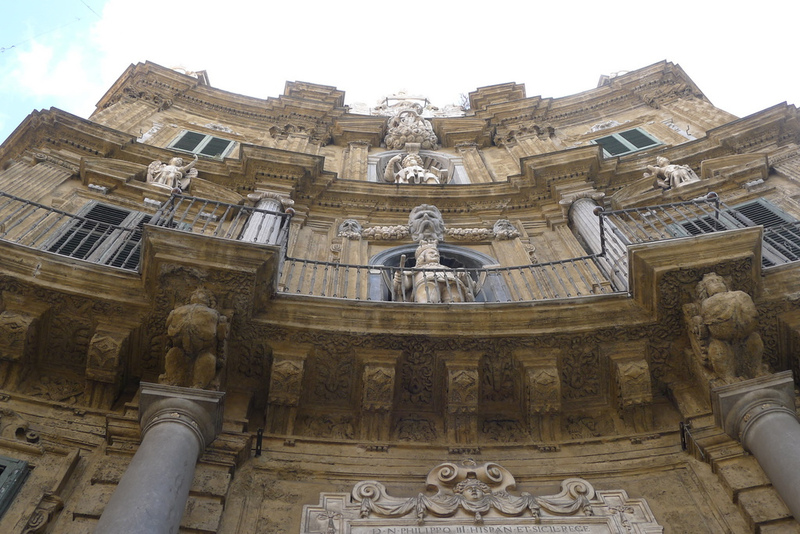 The sculptures on the facade of the building illustrated various themes: the Four Seasons and patron saints of Palermo’s four old quarters. This action can be seen as a historic moment of public awareness of an architectural intention with regards to the four-division. The ‘Quattro Canti’ is the hallmark of a (renewed) four-fold awareness-of-the-numerological-kind in Europe. The medieval city, like Bristol (England) and many more, went to a period of transition around the year 1500 – the arbitrary year, which is given as the Pivotal Point in the European cultural history (fig. 545). Fig. 545 – This outlay of the city of Bristol (England) is given by Robert Ricart (1506) on one of the earliest maps of an English town. The plan shows an original quadrivium (crossing of roads), which was upgraded in the Middle Ages to a fortified town with four gates: New Gate (Porta Nova), St Nicholas’ Gate, St Leonard’s Gate and St. John’s Gate. Only the latter, at the top of Broad Street, survived. The colonial cities of the early sixteenth century were the result of the expansion movement of European countries, like the Portugal, Spain, England and Holland. They were created in the spirit of the time. 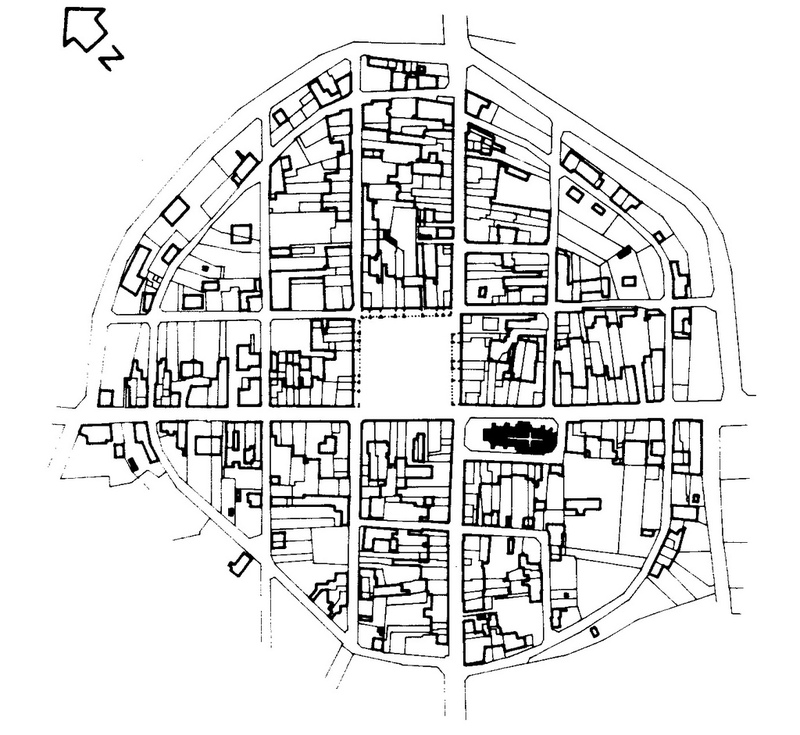 The geometrical city plans, which were en vogue in the (post) Renaissance in Europe, could be put to practice in the new territories. 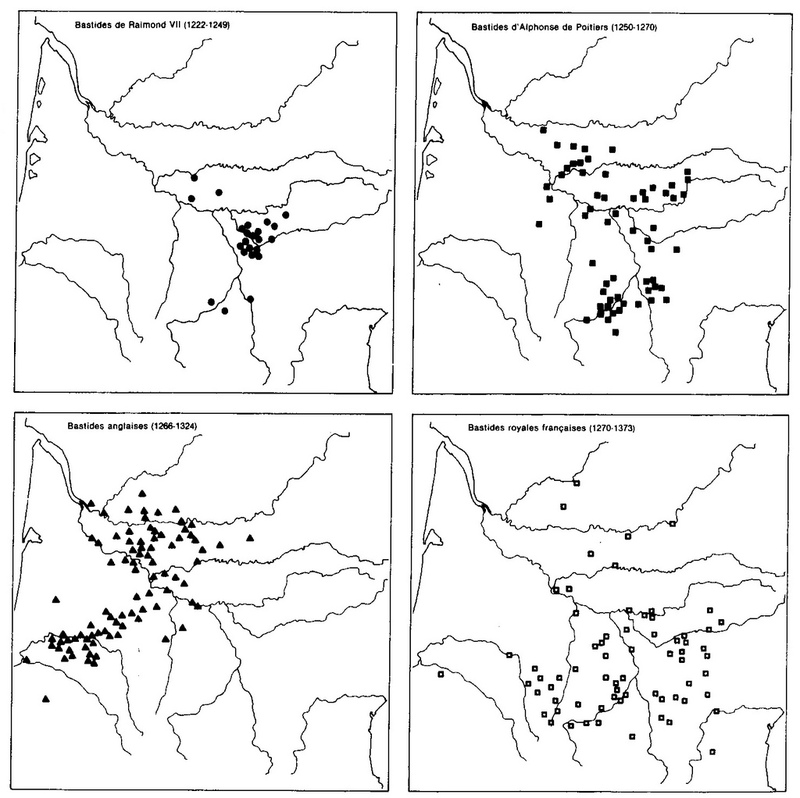 Sometimes, as in the city of Tenochtitlan – now known as the capital Mexico City – indigenous ideas about cross patterns were already present (fig. 546). Fig. 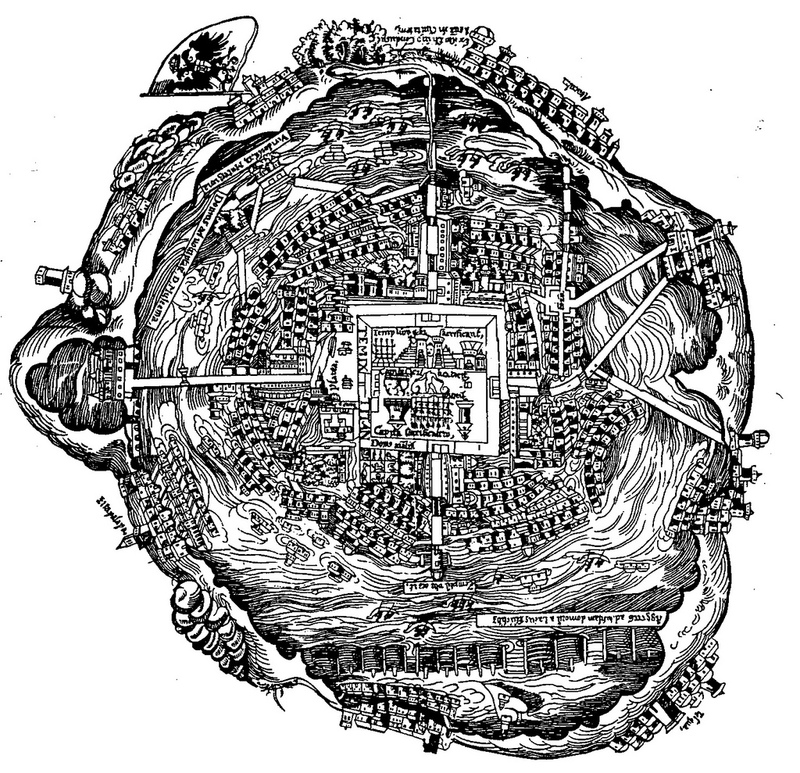 546 – The first map of the city of Tenochtitlan was given as a woodcut in the ‘Praeclara Fernanadi de Nova Maris Oceani Hispana Narratio’, published in Nürnberg in 1524. The original coloured illustration accompanied an edition of letters by the explorer Hernandes Cortes to the King of Spain. The interpretation of the 1524-map of Tenochtitlan and subsequent maps of the capital of Mexico in the sixteenth century poses specific problems, which are relevant in the present investigation. The use of the symbolic cross (Second Quadrant), orthogonal planning (Third Quadrant) and/or the gridion (Fourth Quadrant) by either the autonomous urban civilization or its conquerors offers a challenge for a modern researchers. Fig. 547 – The map of Tenochtitlan from the collection of ‘Navigations and Travels’ (1556) of Giovanni Battista Ramusio (1485 – 1557) gives the directions as Settentrione (North), Levante (East), Austro (South) and Ponente (West, where the sun goes down). The position of the Aztec capital within a lake is clearly visible on this map, which borrows heavily from the one accompanying Cortes’ letters, some thirty years earlier. The name of the Nürnberg map (of 1524) – ‘Proeclara Ferdinandi Cortesii de Nova Maris Oceani Hispanian Narratio’ – translates as ‘the Clear Narration by Hernan Cortes about the New Spain of the Atlantic Ocean’). KAGAN (2000) has the best (colored) representation of the map. Some suggest that Albrecht Dürer or one of his brothers made the woodcut (PENNICK, 1979). Most illustrations in the literature (including fig. 546) omit the additional drawing of the Gulf of Mexico, which was situated on the original map to the left of the city. 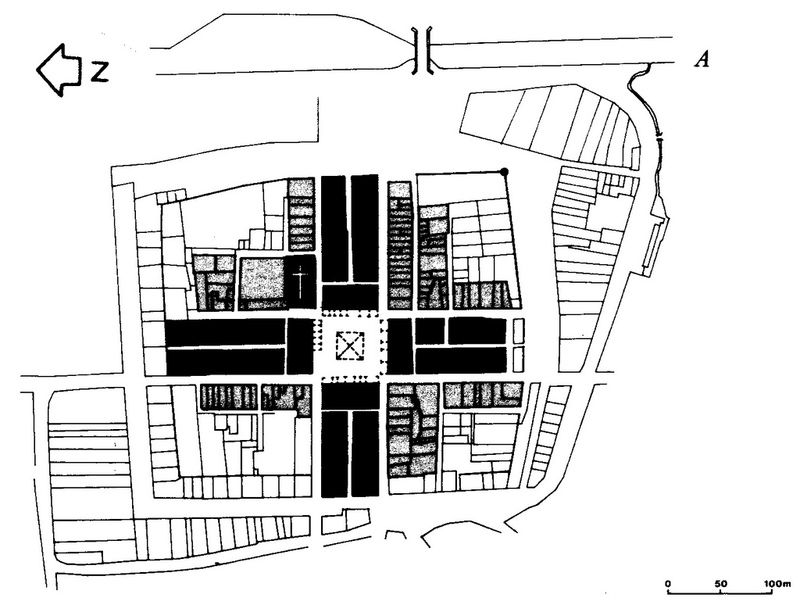 The map of Tenochtitlan has a European style, but suggests a native source (KAGAN, 2000). The Nürnberg map did not give an orientation, but one can infer – from the Gulf of Mexico addition – that the north is pointing downwards. Fortunately, another plan of Tenochtitlan, which was published in the famous collection of Ramusio (Navigatione et viaggi, Vol 3, 1556), indicated the orientations (fig. 547). The map is similar to the 1524-map with the Y-forked causeway to the right. The ‘Templu(m) ubi orant’ (Temple of Worship) was situated at the bottom. It was protected by a row of ‘aggeres’ (ramparts). A T-split causeway is drawn to the left. The houses of Yztapalaya (Ixtapalapa) are situated on the left hand (eastern) side of ‘Lago Salso’. The large ‘Lago Dolce’ occupies the upper half (southern part) of the woodcut. The city was originally built on several islands (isla primitiva) in Lake Texcoco. ‘The indigenous conception of Tenochtitlan was an axis mundi, the symbolic center of the Aztec universe, as well as schematized depictions of Anahuac, or ‘place surrounded by waters’ (MUNDY, 1998). The traditional founding date of Tenochtitlan is given as 1325 AD. Three access gateways led from the complex to the causeways of Tepeyac (north-west), Ixtapalapa (east) and Tacuba (south), according to an interpretation by Ignacio MARQUINA (1951) in his publication on the Arquitectura prehispánica (I.N.A.H., Mexico). The Mexican architect and historian Manuel Carrera Stampa gave a sketch (Planos de la Ciudad, 1949) of the evolution of Tenochtitlan and the city of Mexico from 1325 to 1519, which was elucidated and extended by Manuel Aguirre BOTELLO (2003) to the year 2006. He added – in pencil – the directions (north to the left), but this information is hard to link with the island situation in the 1524-map. A collection of maps by Benedetto Bordone, known as the ‘Islario’ (‘Island Atlas’), was published in Venice in 1528, some four years after the Nürnberg map (HARDOY, 1964/1973). A comparison of ‘La gran città di Temixtitan’ (fig. 548) with the earlier map brings curious inconsistencies to light. The Bordone map is a mirror image along a vertical axis of the 1524-map. The Y-forked causeway points to the left, the T-shaped causeway to the right and the city of Atacuba is in the upper left-hand corner. One can infer, like the 1524-map, that the north is pointing downwards, since Tacuba (Atacuba), in the upper left-hand corner of the map, is in the southern part of modern Mexico City. Yztapalaya (Ixtapalapa) is then situated, in this ‘upside down’ map, in the north-west, while the present part of Mexico City is located in the south-east. The ‘piazza’ next to the square court of the Templo Major is shifted from the left (east) side (in 1524) to the right side (in 1528). So something must have gone terribly wrong in the drawing or printing room of Bordones’ atlas. This error had a persistent lease of life. It occurred on the engraving of the city, which was published in the ‘Civitas Orbis Terrarum’ by Georg Braun and Frans Hogenberg (Brussels, 1598; vol. I, p. 58). The picture follows the (mirror image) of the ‘island atlas’ of Bordone, with the Y-fork dam to the left. Another (late) follower of the mistake was an engraving of ‘Mexico’ (City) by Girolamo Savonarola in his ‘Universus terrarum orbis’, published in Padua in 1713. The inspiration for this map (given in KAGAN, 2000; fig. 4.22) was also clearly derived from Bordone’s ‘Islario’. Fig. 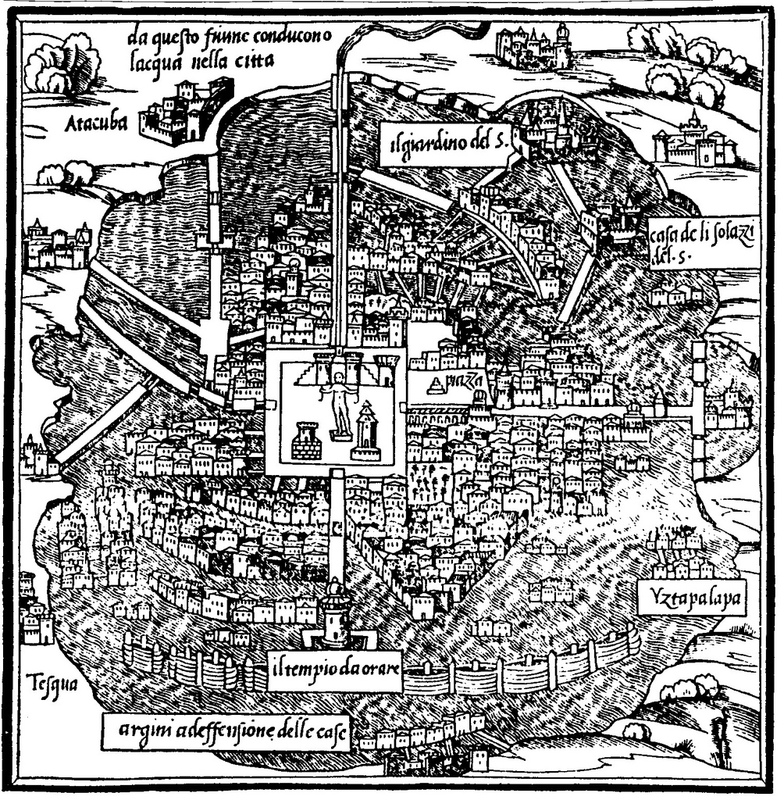 548 – This map of Tenochtitlan (Mexico City) was first published in the ‘Island Atlas’ of Benedetto Bordone (‘Libro di Benedetto Bordone nel quale si ragiona de tutta l’isole del mondo con liloro nomi antichi y moderni’) and published in Venice in 1528. These tribulations in the history of map making are interesting in their own right, but the (quadralectic) aim of this investigation was initially directed to the prominence of the geometric relevance of the city outlay. Both the (first) Nürnberg-map (of 1524) and somewhat less in the (later) Ramusio-map (of 1556) indicated a central square with four main causeways. The houses are in an orthogonal order, but not in a distinct grid. The geometry (of the cross) is not basically influenced in the ‘mirror’ visions of Bordone(1528), Braun & Hogenberg (1598) and Savonarola (1713). Their houses are also organized in a rather haphazardly way. An exception is a unique map of Mexico City (Tenochtitlan) in the Uppsala University Library, showing the city and the Valley of Mexico from around 1550 AD. with a classical grid pattern. The representation looks idealized, but it was true that the Spaniards chose for this type of city design after their terrible destruction of the town in 1521. An estimate of two hundred thousand casualties and many demolished buildings were the result of this clash of cultures. The printed versions of manuscripts by the Spanish Franciscan friar Bernardino de Sahagún appeared in the second half of the sixteenth century. Two of his manuscripts were richly illustrated: the Primeros Memoriales (1559 – 1561) and the twelve-volume Codex Florentino (1578 – 1580), with 1846 illustrations. 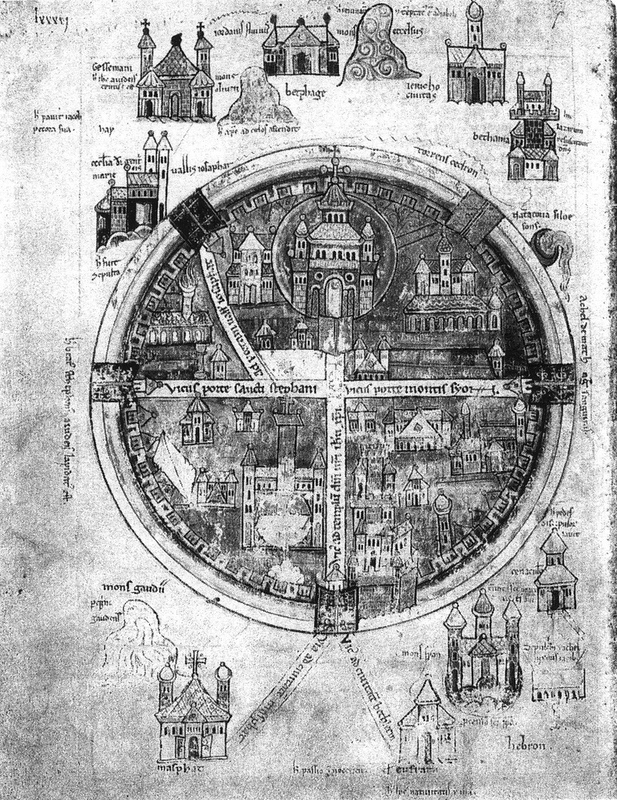 The round ‘Renaissance’ city map, as given in the Nürnberg-map, was a favored way to represent cities in the early days of printing, even if their layout did not fully comply to a circle. The force of symbolic elements (like the circle) still played an important role to reach the mind of the people, even if they were not in line with the scientific ‘facts’ (which were often scanty anyway). It cannot be excluded that the collective memory of this type of representations goes back to the round maps of Jerusalem, which occurred in the medieval manuscripts. The often-reproduced medieval city map of Jerusalem is from a Psalter fragment, dating from around 1200 and kept at the Koninklijke Bibliotheek in The Hague (KB, 76 F 5). A Flemish map of the city, from around the same time (1170), is in the British Museum (MS Add 32343, fol. 15r; KRINSKY, 1970). A lesser-known map of Jerusalem is filed in the Uppsala Library (Sweden; C 691, folio LXXXVI) (fig. 549). Fig. 549 – The round City of Jerusalem is given with a cross street pattern and a Y-fork in the upper left quadrant (Uppsala University Library, C 673, folio LXXXVI). The iconographic representation of Jerusalem in manuscripts of the twelfth and thirteenth century might have been the inspirational source for the symbolic map makers around Europe’s ‘Pivotal Point’ in 1500. 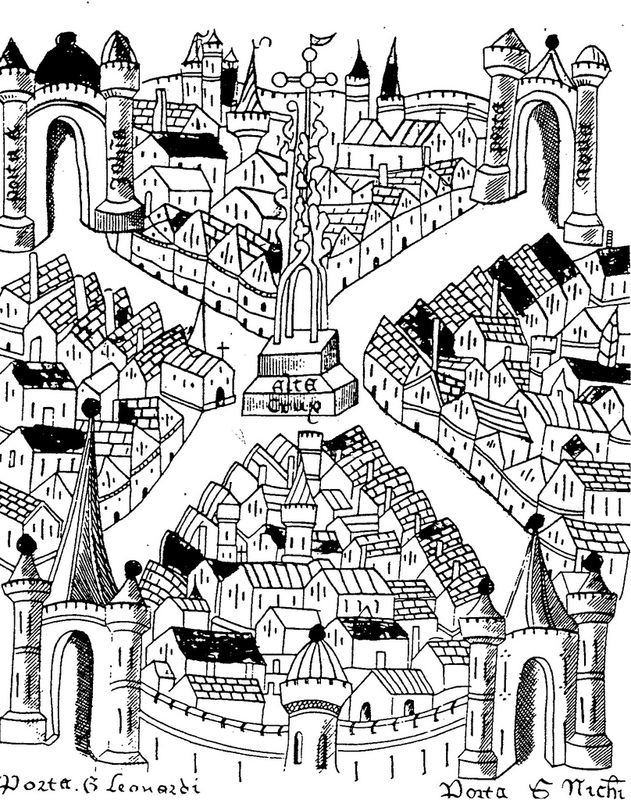 The four-fold division of the Holy City on this latter illustration shows a Y-forked road in a similar way as on the Bordones map. The map in Uppsala (and the British Museum, but not on the map in The Hague) names the forked road as the ‘Vicus ad portam Josaphat’, leading to the Vallis Josaphat, which was known as the place of judgement (vallis judicii). An Icelandic map from around 1300 and now in the Arnamagnaeanske Institute in Kopenhagen (MS 736), indicates the same circle-and-cross patterns of Jerusalem, with a fork in the upper left-hand part. It seems that this feature was a returning iconographic element, which might even be the (hidden, intentional) reason for the drastic measures in Bordone’s ‘Islario’ to ‘mirror’ the 1524-Nuremberg map. The Y-shape road – and the choice between two roads in general – became known as the ‘bivium’ (ESMEIJER, 1973/1984). It symbolized the choice between the wide (bad) and the narrow (good). The first goes to the left, the second road leads to the right. The theme also circulated as ‘the choice of Hercules’. The dilemma between right or wrong gained popularity from the fifteenth century onwards in works by artists like Sebastian Brant (Stultifera Navis, 1497), Cranach the Elder (Hercules at the Cross-roads, 1537), Johann Sadeler (1595) and others (PANOFSKY, 1930). The line of the symbolism of the circle-and-cross city could be drawn even further if the activities of the Roman land surveyors (agrimensores) are taken into account. RYKWERT (1976) pointed to the ceremonial actions (contemplatio) that took place when a new encampment or city was planned. The ’templum’ was the name given to the diagram drawn by the augur. The Roman writer Marcus Terentius Varro (116 – 27 BC) elaborated on the ‘templum’ as a place where nature (sky), divination (ground) and resemblance (underground) came together. His heavenly templum has a cross form (fig. 550), but the directions do not necessarily have to line up with the cardinal points. Fig. 550 – A redrawn version of the ‘Templum of the Sky’ as given in a miniature depicting the ‘Constitutio Limitum’. The ritual of ‘making a boundary’ was described by the Roman writer Hyginus Gromaticus, a near-contemporary of Vitruvius. The Greek word ‘temenos’ had the same intention, pointing to a piece of land defined by boundaries and devoted to a particular purpose, a shrine. Hygius Gromaticus was one of the contributors to the Corpus Agrimensorum, a sixth century manuscript on surveying. Social, political and intellectual events followed each other in quick succession in the sixteenth century, after Europe passed its Pivotal Point. Knowledge increased dramatically under the influence of the printing press on a scale, which can only be compared with the introduction of the Internet at the end of the twentieth century. The circular and its enclosed unity was a thing of the past. The linear moved in, pointing to ever-wider horizons. Oppositional thinking was followed to its most unforeseen consequences. The European Age of Discovery found its very roots in the psychological intention of ‘going all the way’. The will to reach the ultimate boundaries and a ‘testing to destruction’ (HEDGES, 1974) are typical characteristics of this process. The ‘grid town’ – in itself a ‘Fourth Quadrant’ member in a lineage from the ‘Second Quadrant’ cross to the ‘Third Quadrant’ square – was implanted by the colonial powers into the Aztec culture. This culture, being in the ‘Fourth Quadrant’ of its own development, accepted the orderly approach of the Spaniards in a natural way. The ‘four division’ was well known to the inhabitants of Mexico. The tetradic sign was expressed in the four canals at the founding of Tenochtitlan and was given on the first page of the Codex Mendoza, illustrating the ‘centro geometrico de los cuatro calpullis’ (districts). The Codex Fejérváry-Mayer further elaborates on tetradic symbolism, with its famous first page as a historical tribute to the four-fold. The monumental calendar stones, of which a large number has been found, were devoted towards numbers (see also fig. 123). The encounter between the Spaniards and the Aztecs can be described in the realm of division thinking. The Spaniards were representatives of a ‘Third Quadrant’ European culture around its Pivotal Point (in 1500 AD). They came in contact with the Aztec people, being the representatives of an indigenous American-Indian culture in their ‘Fourth Quadrant’ (see fig. 107 for a suggestion of the CF-graph of the Meso-American cultural period). The outcome of this culture clash, in terms of winning or losing, was hardly surprising. Every cultural entity in its ‘Fourth Quadrant’ is bound to ‘loose’ in a power conflict with another group in its ‘Third Quadrant’. This universal lesson, which holds on all levels of human interaction, finds its very reason in the nature of the Fourth Quadrant. The position in the third part of the Fourth Quadrant (IV, 3), just before the end of the visible visibility, is a fragile one in which the knowledge of the past and the insight in the future leaves a culture (or person) in a vulnerable position in any ‘fight’, which is another expression of a full Third Quadrant encounter. The cross concept, which was the subject of this chapter, remained a strong architectural tool in the ages to come. The example of Palermo and its Quattro Canti has been mentioned earlier. The classical practice of conrectio (‘a division in four parts – bringing the four directions together again by formula and gesture’; RYKWERT, 1976, p. 46) got a whole new lease of life in the minds of the post-Renaissance city builders. The ritual character of the (Roman) augur was a thing of the past, but the practical advantages of a cross-town – even with vague religious references to the Christian cross – were obvious. Most settlers in America left a European culture, which was in a state of vibrant transition, experiencing the psychological extremes of the ‘Third Quadrant’ (III). Their motivation to leave Europe was a mixture of the spirit ‘to go all the way’ (in economic enterprise) and the will to escape the mounting political and social pressure. Hardships were generated by the inherent intolerance of oppositional thinking, both by the oppressor and the oppressed. Once the emigrants entered the wide-open spaces of a new land, they found themselves at the start of an ‘American’ cultural period. They had to discover the sense of their self-styled presence and find the road to a historical identity. The interpretation of the quadralectic communication cycle propagate that all options are open in the First Quadrant and ideas begin to materialize in the Second Quadrant. The beginning of the ‘visible visibility’ of the young American nation can be placed at the proclamation of the Declaration of Independence on the 4th of July 1776. The statement marked the First Visibility (FV) of the American cultural period. This point is, by definition, situated on the CF-graph at the boundary between the first (II, 1) and second part (II, 2) of the Second Quadrant (see Chapter 7). A communication graph can be drawn – as a second premise – when two Points of Recognition (POR) are established. 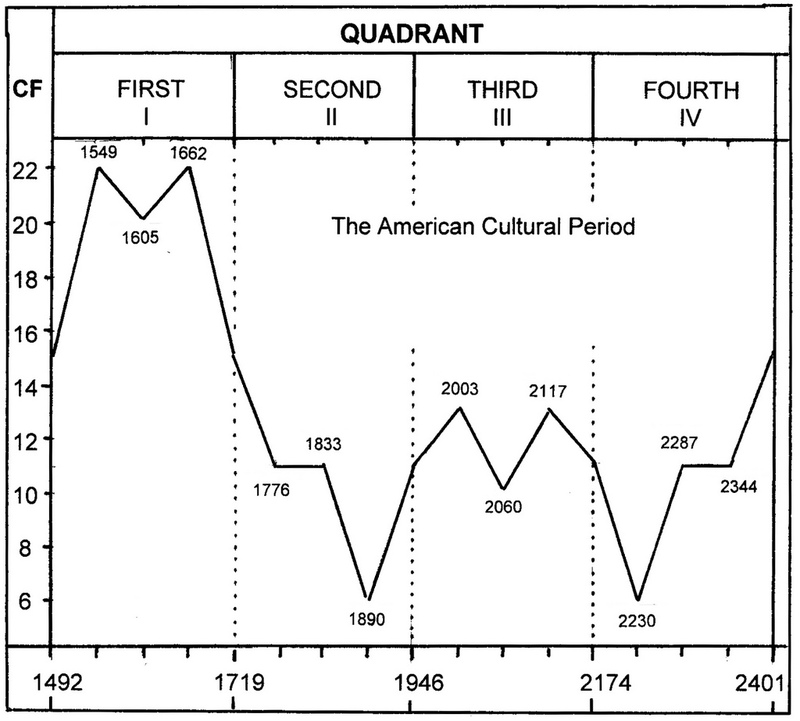 Fig 551 gives a suggested CF- graph for the American cultural period, assuming that the ‘beginning’ of such a period is placed at the arrival of Christopher Columbus in 1492. Fig. 551 – A proposal for the American cultural period is given here with the beginning (of the First Quadrant) in 1492 (when Columbus arrived) and the First Visibility (FV) in 1776 (the year in which the Declaration of Independence was proclaimed). The presence and culture of native Indians on the American continent – long before the first arrival of European settlers – should to be placed in a previous cultural cycle. This historical situation is comparable with all great cultural periods, which had a predecessor: the Greek had the Minoans, the Romans followed their Etruscan roots and Europe had its Celts. People living in further archaeological distinctions some (ten) thousands years ago – like the Stone, Iron or Bronze Age – are even harder to position in a ‘communication cycle’. An interesting point of the proposal for the American cultural period (in fig. 551) is the situation around the year 2003. This marker on the CF-graph is known (from analogy with other cultures) as the First Visibility Crisis (FVC). It is situated at the boundary between the first (III, 1) and second (III, 2) part of the Third Quadrant. It is characterized – in particular with a reference to the psychological setting in the Egyptian cultural history – by a lost innocence and an awareness of shortcomings. The former was created by the attack on the Twin Towers in New York (2001). The latter came about in an irresponsible political and financial behavior some years later. The communal feeling at this point (FVC) is one of disappointment. This perception is certainly recognizable in America today, after a disrespect for the truth and misguiding conduct by the government, leading to senseless wars. The United States of America have lost a great deal of sympathy and understanding of an older European generation, which still remembers the role of the Americans in the Second World War. The new (European) settlers in America went in their early years (sixteenth- seventeenth century) through all the confusing possibilities of architecture. The Second Quadrant is characterized by a multiplicity of ideas, which come to the surface simultaneously. The four geometric features of circle, cross, square and grid could exist side by side. Ideas can change overnight, as was seen in the town of Circleville (fig. 533/534). However, the most favorite design was the grid-pattern, described in chapter 4.1.3.4.5 (The American grid towns). A typical example of the tribulations of symbolism over the years and its outcome in architecture is found in the Nebraska State Capitol in Lincoln, Nebraska (LUEBKE, 1993). Architect Bertram Grosvenor Goodhue (‘No. 4’) won the nationwide design competition in 1920 and the building came to completion in four phases over ten years (1922 – 1932) (fig. 552). Fig. 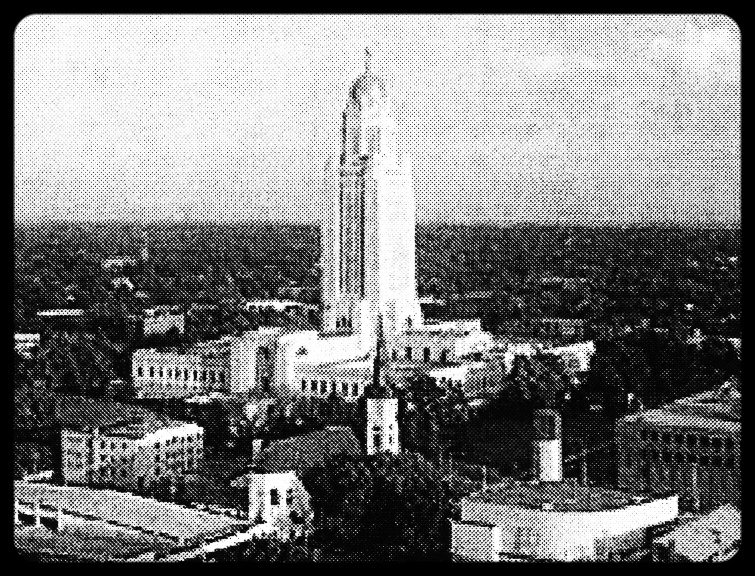 552 – The cross-in-square plan of the Nebraska State Capitol is supported in the actual building by a wealth of Egyptian, Greek, Roman, Biblical and Art Deco symbolism – pointing to a confused cultural identity. The cross-design of a settlement was much older than the efforts made by the Renaissance artists and sixteenth and seventeenth century popes to give this outlay certain humanistic or religious meanings. The circle-and-cross design was known from settlements dating from Carolingian times and thereafter (800 – 1050 AD), like the previously mentioned Viking settlement Trelleborg near Slagelse (Denmark, fig. 525). Another attractive example of this plan (of the ninth century) can be found in Oost Souburg, near Vlissingen in the Dutch province of Zeeland. French royal bastides (1270 – 1373) (fig. 554; fig. 556). Fig. 553 – An overview of the various bastides in southwestern France, distributed in time under the consecutive French and English rulers. Fig. 554 – The bastide of Solomiac, northwest of Toulouse, was founded by the French royals in 1332. It has the lay-out of a parallel cross, which provides space for the central market square. The church is on the eastern side of the inner octagonal defense system. Many villages in the foothills of the Pyrenees, in particular the older ones of the first generation, tended to follow topographic heights (known as ‘pech’). The village was often protected by a fortress, like the famous Montségur (Ariège), known from its Cathar castle. Another Cathar stronghold, and one of the earliest bastides (1222), was Cordes-sur-Ciel (‘corte’ meaning ‘rocky heights’) in the Languedoc (Tarn). Small places, like Domme (Périgord), Castelnau-Bretenoux (Lot), Sainte-Mère (Gers) and Tournon d’Agenais (Lot-et-Garonne) also used topography to create safety. The bastides of the second generation by Alphonse de Poitiers, in the middle of the thirteenth century, often showed a premeditated plan, which was less dependent from the local environment. Sainte-Foy-la-Grande, Villeneuve-sur-Lot and Villefranche-de-Rouergue are among the most typical of the total of about fifty bastides, which were built during his reign. John REPS (2002) suggested that the move towards the fortified places comprised an element of real estate speculation and that the reason was not primary one of security. Most bastides were protected only by a palisade and a ditch. In fact, the search was for freedom (franchises), because the farmers, who moved their families into the city enclosure, were no longer vassals of the local lord. The landowners, on the other hand, gained income from taxes on trade, rather than the previous taxes on production (tithes). 1. The circular bastides – like Fourcès (Gers) – are rare, but many plans followed a concentric or oval pattern, often around a church, like Prayssas (Lot-et-Garonne), Martres-Tolosane (Haute-Garonne) and an important group of ‘circular villages’ in Gastogne, like Montpezat, Ayguetinte, Endofielle, Urdens, Gazaupouy and many others. A rainy day in Fources, a round bastide. (Photo: Marten Kuilman, 2009). 2. The (single) cross pattern (or cross roads, known in the Latin Antiquity as a quadrivium) has been the base of many fortified places, but the necessity of a market place (in conjunction with a church) presented new problems of urban design and called for a ‘widening’ of the initial cross. 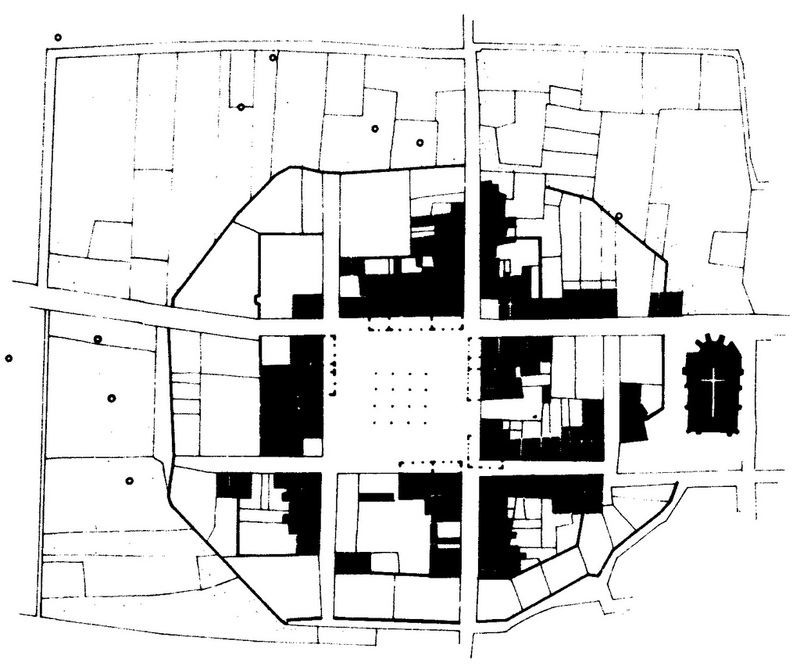 The resulting ‘modèle gascon’ (Gascogne model) is characterized by the ‘quadrillage’ of eight blocks of houses around an ‘empty’ center (fig. 554/555). It is remarkable that this French term, meaning a (rectangular) grid or raster, is also known as a technique of counter-insurgency, first used in the 1957 Battle of Algiers. This system denotes a method of dividing a counter-insurgency terrain into ‘squares’ to isolate the people within. The small community of Cologne in the Armagnac area of France was built in the Gascon style with a market square, a market hall and arcaded buildings (fig. 555). The central part is enclosed in a (more or less) octagonal defense system. The place was founded in 1284. Fig. 555 – The plan of Cologne, a small French royal bastide situated some fifty kilometers north west of Toulouse (France), shows a simple 3 x 3 grid pattern. The central square was reserved for the market, as the main raison d’etre for the new town. The location of the church moved to the edge of the external octagonal. A further extension of the Cologne plan can be seen in the French royal bastide of Revel, in the Haute-Garonne. A second ‘ring’ of blocks has been added to the original 3 x 3 layout, forming a 5 x 5 grid. The (more of less) octagonal enclosure was smoothened out to a hexagonal ring (fig. 556). A similar setup was found in settlements like Geaune (Landes), Rabastens-de-Bigorre (Haute-Pyrénées) and Marciac (Gers). The hexagonal enclosure is in these latter places further developed into a semi-circular or oval girdle. The eccentric position of the church is typical for the Gascon type, whereas the church is still next to the square in the ‘modèle aquitain’. It shows that this town was primary developed for commercial reasons, with the market rather than the church in the central space. Fig. 556 – The plan of Revel (Haute-Garonne, France) is a typical example of a French royal settlement, charted in 1342. The 3 x 3 grid is now extended to a rough 5 x 5 grid, with the church situated at the southwest and outside the grid. Two examples of the ‘Aquitaine model’ will be given here, one from the English and one from the French side. The first is the bastide of Creon (Gironde), which was a stronghold of the English king. 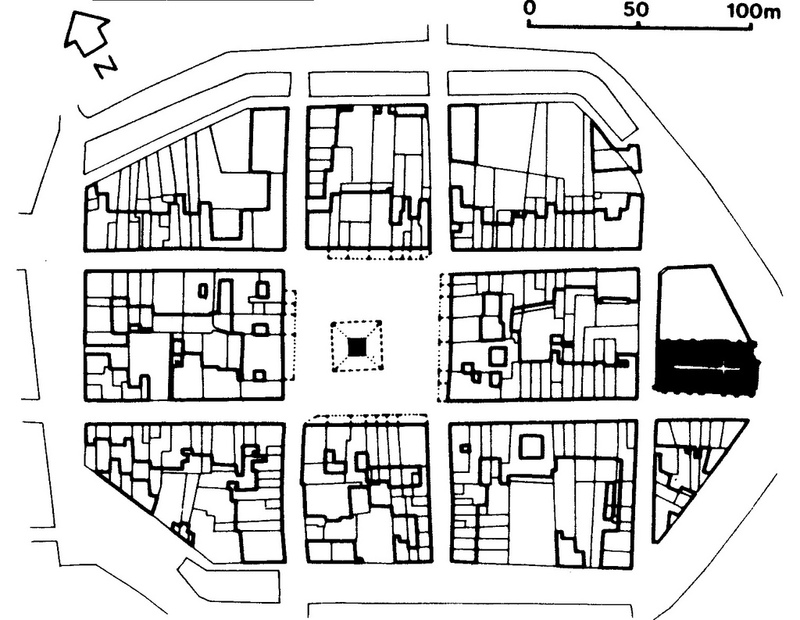 The plan of the settlement has an orthogonal quadrillé, which did not go into a full 5 x 5 grid, but only extended the east-west streets (fig. 557). Fig. 557 – The bastide of Creon (Gironde, Bordelais) was founded by the English king in 1316 and had a double-cross pattern with a semi-circular enclosure. Créon was situated on important crossroads from Bordeaux to Sauveterre and from Libourne to Cadillac. The building of the church started in 1316 and was finished in 1320. Its position is close to the central market square. The church was later extended in order to keep up with the stature of the place as the capital of the Entre-deux-Mers region. Initially, Créon did not have fortifications during the Hundred Years’ War (starting in 1337) and was therefore pillaged and burned, but this was remedied in 1351 when the place got a fosse, palisade and four stone gates. The covered houses around the market square dated of the sixteenth century. The gates were demolished in 1589. The second bastide is Damazan (Lot-et-Garonne, Aquitaine), which was a stronghold of Alphonse de Poitiers. The city was founded in 1259 and had a parallel cross design with the church in the north-eastern corner of the adjacent market square (fig. 558). There are only traces of an enceinte (fortified ring), now the Boulevard du Midi. The design found a follower in the ‘English’ bastide of Vianne (Lot-et-Garonne), some ten kilometers south of Damazan. This pedigree proved that the cross design was ‘cross border’. Fig. 558 – The ‘castrum comitale’ of Damazan (Lot-et-Garonne) was a creation by Alphonse of Poitiers in 1269 and is an advanced development of the Aquitaine model. Alphonse, the Count of Toulouse and of Poitiers (1220 – 1271) was the son of the French king Louis VIII and brother of Louis IX. He had earned his credentials in a crusade (the seventh, 1248) to the Holy Land. After his capture and return, he organized the rebuilding of the southern part of France after the ravages of the Albigensian war (1209 – 1255). This struggle, which was initiated by Pope Innocent III (1198 – 1216) to curb the growing influence of Catharism (and dualistic thinking in general) is an important marker point at the boundary of the Second (600 – 1200) and Third (1200 – 1800) Quadrant of the European cultural history. 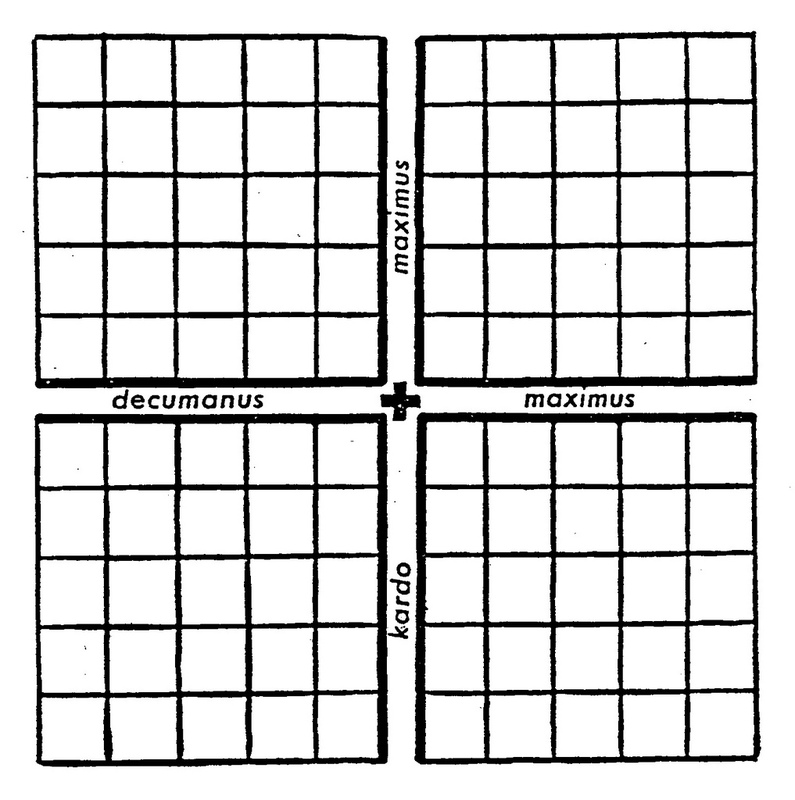 The Roman Church, as a representative of a (religious) form of fourfold thinking (in the Second Quadrant) took up arms in a heroic effort to fight a form of lower division thinking (in the Third Quadrant). The result was a temporary victory, but the seeds of lower division thinking – with its urge for visible visibility and power – were growing anyway. The cultural entity of Europe left its stage of adolescence and had to face adulthood. These examples of the cross design in urban development disclosed the flexibility of the design in combination with circular, octagonal or hexagonal enclosures. This whole complex of delineations was sometimes placed in an outer square (like Solomiac) or further developed in an extended grid system (like Revel). 3. The square was the most common layout in the new towns of the thirteenth century. 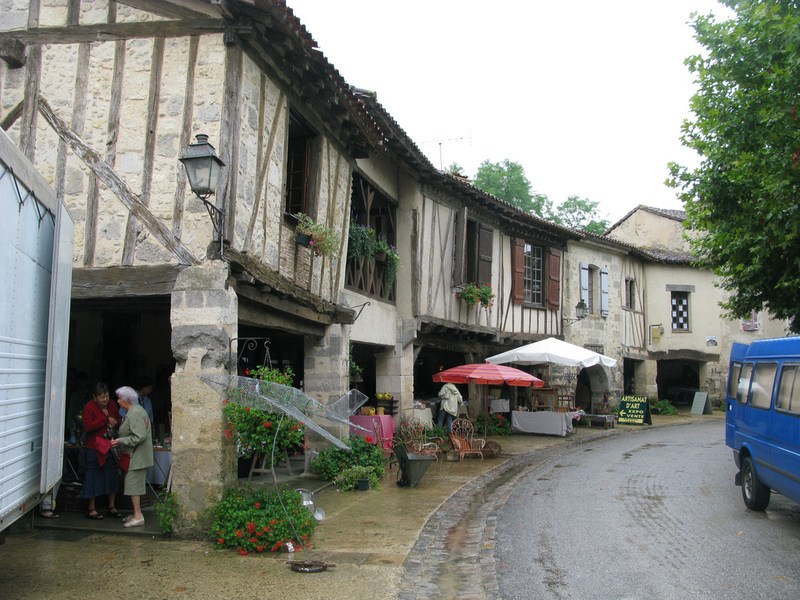 The rectangular street pattern of Monpazier is archetypal for these types of bastides. Monpazier was known as ‘the pearl of England’ in the Dordogne and is still one of the best-preserved bastides in France. The place was built in 1285 during the reign of Edward I (Confessor). It was part of the English defensive system in the southern Périgord, which also included the bastides of Lalinde (1267), Beaumont-du-Périgord (1272), Molières (1284) and Fonroque (1284) and the incomplete efforts like Pépicou, Roquine, Castelréal, Puyguilhem, Beaulieu and Labastide. The opposing French side in the area consisted of the fortified places of Rayet, Villeréal, Castellonnès and Montflanquin. 4. The octagon and grid-type of urban development are the ‘end’ members of respectively a cyclic or linear approach in a Fourth Quadrant setting. Both types occur, as could be noticed in the previous illustrations of bastides, in conjunction with other geometrical devices like the cross and the square. It is important to notice that these ‘advanced’ forms were part of the very early development of the fortified cities and do not seem to fit in a hierarchical order (in time). A quadralectic appraisal of the various fortified towns in southern France had to employ a different angle then usually followed in literature. The four-fold division in a temporal setting by LAURET et al (1988) is valuable as a political division, but does not refer to architectural features. The four-fold division of the different types (Aquitaine, Gimontois, Gascon and Quercimois model) – as chosen by John REPS (2002) from a larger number distinguished by French scholars ‘with an almost Teutonic thoroughness’ – points to the regional character and geographical setting of the bastides. The quadralectic attention should focus on the designer’s use of the four geometrical tools embodied in the circle, cross, square and octagon/grid. The absence of a hierarchical development is clear, just like signs of difference between urban designs from both sides of the ancient English – French border. The architect Bernardo Antonio Vittone (1705 – 1770) won the first price in the Concorso Clementino in 1732 with a scheme of a city at the sea (fig. 559). This prestigious Concorco produced a number of interesting ideas between the years 1700 and 1750 (HAGER, 1982) and later when the concourse became an international competition for young European architects (STILLMAN, 1973). The Concorso was sponsored by the Acca-demia di San Luca in Rome and got support from – and was controlled by – the papacy, in particular Pope Clement XI (papacy from 1700 – 1721), who was a patron of the arts. The various architects tried all types of geometrical forms over the years, covering the style periods from Late Baroque to Neo-Classicism. The Polish architect Kaspar Barzanka (1680 – 1726) won a first price in 1704 with a tetradic ‘Pubblica Curia’. The triangle (hexagonal) form was the theme of the Concorso in 1705. Filippo Juvarra (1678 – 1736) was the winner with his ‘Palazzo in villa per tre personaggi ’ (A palace for three noble persons of equal range). Carlo Stefano Fontana, the nephew of the famous Baroque architect Carlo Fontana (1638 – 1714), gained a second price that year. Fig. 559 – This cross design of a city at the sea (Ancona) by Bernardo Antonio Vittone, an Italian architect of the Rococo period, won the first price in the Concorso Clementino in 1732. The fountain in the middle was a copy of Bernini’s ‘Four Rivers’ fountain on the Piazza Navona in Rome. Vittone was a brilliant Italian architect, a pupil of Filippo Juvarra, and active in the Piedmont area. He attempted to prove the correct classic proportions of buildings in a mathematical way. The Capella della Visitazione at Vallinotto (near Carignano) is one of his masterpieces with a pagoda-like dome, and a hexagonal interior with alternating convex and concave chapels. The cross, as the basic element of a plan, never lost its attraction in the Fourth Quadrant (IV) of Europe’s cultural history – starting in 1800. The sign was no longer a religious associated symbol, but became a tool for expression of the four-fold in the widest sense. It pointed to a new conception of space, which had found its own designated place in an infinite universe. The school of French architects at the beginning of the nineteenth century, like Ledoux, Boullée and Lequeu experienced the thrill of entering uncharted terrain on the boundary of Neo-Classicism and utopian dreams. The cross also featured in the design of futuristic cities, like Ledoux’s design for the city of Chaux and the model town ‘Victoria’ by James Silk Buckingham (1849; see fig. 666). The comprehension of a wider field of division thinking at the beginning of the nineteenth century resulted in an explosion of creativity in knowledge, science, art and architecture. This (unconscious) process did not stop, but rather matured in the two hundred years of development. It is only now, in the context of the quadralectic philosophy, that the real meaning of the cross can be understood: it symbolizes the four division in the mind and provides a freedom of vision. The various quadrants are areas of different visibility (place), but also stages in a cyclic presence (time), which can be understood as unity. The rigid cross was not the first choice in city development in the (European) cultural period after 1800. The fantasy of architects searched, in general, for either the mono-directed ‘axiality’ (like Haussmann’s developments of Paris in the 1860’s) or for curved lines, like the later English garden cities. 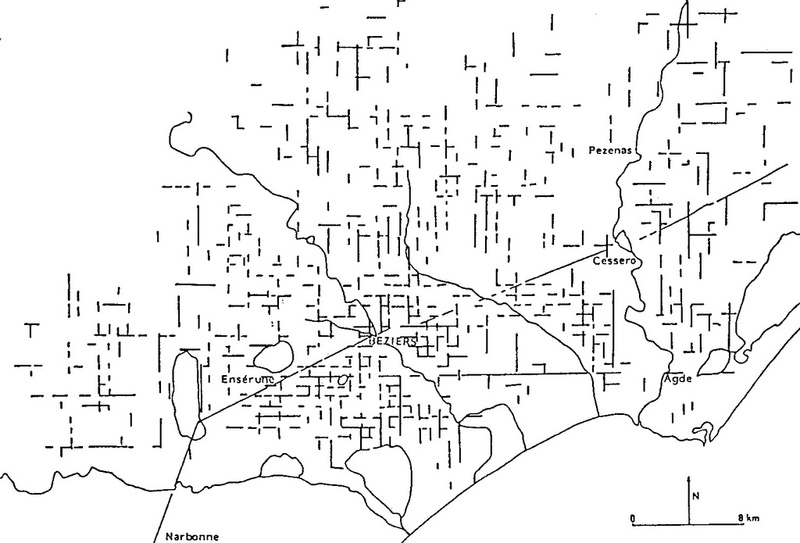 Other large cities, like the Spanish Barcelona, favored the grid (Cerda, 1856). The checkered and cruel history of the German capital Berlin resulted in different types of city planning, notably in the period between the World Wars and after the reunion of East and West Berlin in 1989. Pluriformity was here the name of the game, searching for the use of new materials (like glass and concrete) and three-dimensional forms rather than a fixation of the plan. Another characteristic of urban developments in the nineteenth and twentieth century was the scale: massality was at the base of many ideas. The Swiss-born architect Le Corbusier was probably archetypal in his approach towards city development. The majority of his initial plans did not materialize, but the spirit of his large-scale planning was present in innumerable urban development programs throughout post-war Europe. There is hardly any medium-seized or large city, which escaped the addition of army-like, planned suburbia to house the ‘masses’. The cross-design functioned in the twentieth century building frenzy locally on a neighborhood or suburban scale, but this form did not pretend to dominate the field. There seemed to be no real need to express the four-fold ‘on the ground’. The religious component disappeared long time ago and the secular meaning of the cross as four compartments in space – with their own spiritual meaning – was not yet defined. The acceptance of a quadralectic world view can change this trend. An understanding of its meaning brings the cross – as a distinct element in architectural design – back into the realm of public appreciation and might be subsequent inspire architects to use the sign again.